Tuddenham Mill01638 713552work HotelCombining years of history with a chic yet sympathetic refurbishment, Tuddenham Mill is an intimate boutique hotel and restaurant set in 12 acres of rural Suffolk countryside near Newmarket and Cambridge. This traditional watermill brings together an exceptional environment, a genuine passion for great food and wine, the ultimate in bedroom comforts and discrete yet attentive service. From its exposed beams and water wheel to the contemporary elegance of the bedroom furnishings, Tuddenham Mill offers a unique mix of influences to excite the senses. With fifteen rooms featuring over-sized beds, Bose sound systems and Loewe flat screen TVs, walk-in showers, Missoni dressing gowns and Espa toiletries, the hotel provides the ultimate in comfort and luxury. Combining years of history with a chic yet sympathetic refurbishment, Tuddenham Mill is an intimate boutique hotel and restaurant set in 12 acres of rural Suffolk countryside near Newmarket and Cambridge. This traditional watermill brings together an exceptional environment, a genuine passion for great food and wine, the ultimate in bedroom comforts and discrete yet attentive service. From its exposed beams and water wheel to the contemporary elegance of the bedroom furnishings, Tuddenham Mill offers a unique mix of influences to excite the senses. In the restaurant, Head Chef Lee Bye and his talented team have created exciting, contemporary menus reflecting their passion for fresh food and local produce. 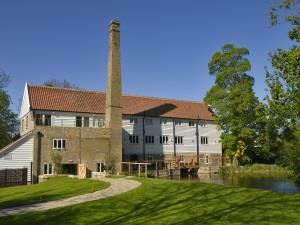 Tuddenham Mill was awarded 2 rosettes by the AA and Good Food Guide 2015 Editors’ Award for the best set lunch.